Victim thinking is really huge for almost everyone (or so it seems). 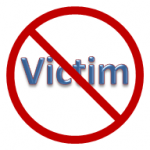 No matter how much they might want to deny it (as most people do) – they feel victimized by the world/life. It seems like they are being controlled by everyone – government down to the person next door or on the road. Of course I am included in it as well. Yesterday I noticed that I was in the victim thinking stuff, and saw clearly the millions of people resonating at that frequency and the instant I had a similar feeling, I was drawn into the frequency! It was instantaneous! I felt the pull and I was there! I didn’t see it right away, so I was in the victim stuff (feeling sorry for myself over something silly), then saw that I was only adding to the energy – increasing it with my thinking/feeling of it! As soon as I saw that, I realized how stupid it was to “wallow” in that energy (even though I really wanted to be there – it felt so “comfortable”), I then started to laugh at myself. That brought me immediately out of it! It is interesting when looking at how we attract things into our lives and it seems like they are “happening to us” rather than seeing that we are actually attracting it. And, for many who do see that (they are attracting it), they feel more victim because of it (feeling “bad” that they would attract such awful things)! Ironic, eh? I know I do this! I feel “bad” that I am attracting the “bad” things, which of course, only increases the “bad” (because I am still in that energy). The only way to end it is to see that I am attracting it .. and do NOTHING (and have no feelings/attachment to it)! Anything I do about it (trying to wipe it out, or shift into “good”) only continues the “bad” thing. You see? I wouldn’t want to “change” it if I didn’t have a feeling/attachment to it as being bad. It is doing something (the “want” to change it) that actually continues it! It is very tricky, eh? If I see it, and have no feelings/attachment about it, then I am no longer in it. If I see it, and try to stop it (or make it “better”) than I am agreeing there is something “bad” and that will only keep it there). Ok – I know that all sounds easier than it is, and I agree … it isn’t as easy as all that. I am not there yet (seeing it without any feeling). And, it is starting to get easier and easier to see it, and then it clears on its own (like yesterday). This is not to say that life is all a “bowl of cherries” – because maybe it is not supposed to be. Maybe we are not supposed to just coast through life doing nothing? Maybe that just creates isolation and separation? Maybe some of the things that seem “bad” are just the universe trying to push us into action, which we would not do ourselves? I do prefer to sit and read or watch TV or get on the computer. I enjoy the “quiet”, and prefer to do nothing (or as close to nothing as possible). I “work” during the day, looking forward to sitting and doing nothing! : ) So maybe I “need” this push into action? I don’t seem to do it on my own? Maybe if I got out there and did things without that, I wouldn’t need it? I don’t know.